Cook spaghetti as directed on package, adding frozen mixed vegetables during last 5 to 7 minutes of cooking time; cook until mixed vegetables are tender. Drain; rinse with cold water to cool. Drain well. 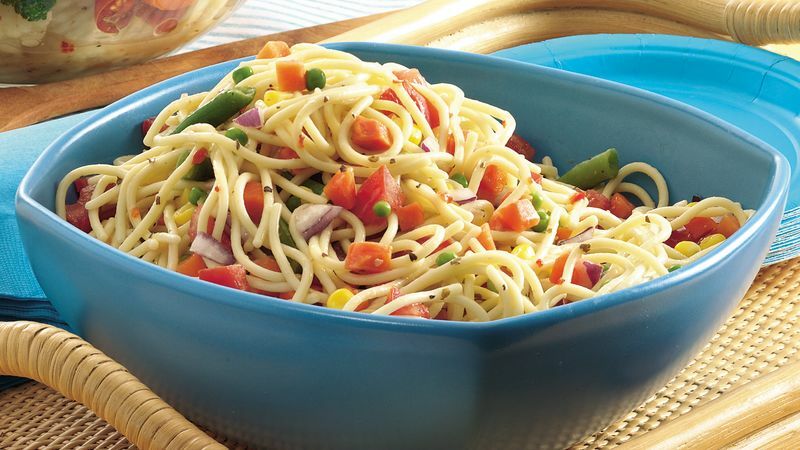 In medium bowl, gently toss cooled cooked spaghetti and vegetables, and remaining ingredients to coat. Cover; refrigerate at least 1 hour to blend flavors before serving. Your favorite frozen vegetable can be used in place of the frozen mixed vegetables.